the perfect starter guitar for young kids. The Baby Taylor is the ultimate travel companion, delivering volume and tone that surprise for its diminutive dimensions. At a 3/4-scale, the Baby Taylor is the little Dreadnought that could. Taylor’s ultra-portable travel mate belies its size with a sweet, full voice and great tone. It also loves little hands, which makes it an irresistible choice for kids taking lessons. 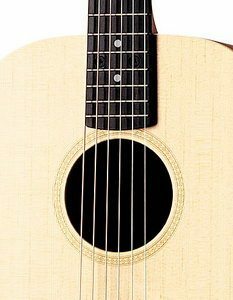 It’s remarkably versatile for special applications, whether played in alternate tunings or high-strung; with a capo or a slide. Available with either a solid spruce or solid mahogany top.